Oversoul Beginner's Guide - . Welcome to the world of Oversoul! Thank you for playing this free, browser-based game. We do hope you will enjoy it. In order to play Oversoul, you must have created an account on the Artix Entertainment Portal Website. You may either register here or click on the "Create a Free Account" button on the bottom of the login screen of the game. Once you have created an account, you may login and create your character! After reading the backstory, click on "Close" in order to assign your name and choose your starting character. In the box below, under "Oversoul Name", you may type in your desired username. This will be the name you are known by inside the game. The username used for logging in will remain the same. Then, you may choose one of five characters for you to use: from left to right, Barbarian, Young Paladin, Fire Witch, Blood Void, and Lighting Wolf. You can see descriptions on them by clicking on the tabs below. Each has its own deck, appearance, backstory, and element. For now, you can only choose one, but you can gain control of the others as well as you progress upon your journey, in addition to many other characters. If you highlighted a character but do not want to use him/her/it, click on the "close" button underneath their backstory. Once you have chosen your desired character and name, click on the "Ok" button in the bottom right hand corner. If your name has already been taken, it will notify you and you must choose a more unique name. If your name is free and you have chosen your character, the game will now log your newly created Oversoul into the game. You currently have three servers to choose from: Nulgath, Warlic, and Testing. All servers are open to all players, but people can only interact with players in the same server. Unlike most games, your account data is identical for all servers. There is no difference to the servers other than the other players you can interact with. 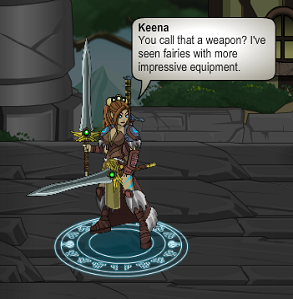 Bio: Keena is a savage barbarian of the northlands. Her tribe worships the god of ice allowing her brutal strikes to be empowered with elemental cold. The Barbarian is a defense based ice character. Her main superior attribute is her abundant shield cards, which allow her to tank a lot of damage. In addition, she wields the powerful freeze lockdown card, which renders the opponent immobile for two turns. Upon ranking up to Veteran, she gains Shatter, a delayed strike that deals one thousand damage to the opponent after four turns. Master rank grants her Ice Orb, which is a powerful nuke that drains your shields to power itself. In effect, it's best used as a finishing blow. Her high shield ratio allows her to soak up a lot of damage while wearing down the opponent with any attacks or shatter damage. Freeze allows her to set up quite well or to lock the opponent, allowing her to deal the finishing blow with shatter or ice orb. All in all, the barbarian is quite an effective stall tank. Shields cap at 2000. Beware of wasted shields if you attempt to shield beyond that cap. Always keep a shield card, whether Ice Wall or Shield, in your hand, so you can replenish any lost shields instantly. A smart tactic is to freeze the opponent two turns before shatter can deal its damage. In this way, they will not be able to mount any sort of defensive measure and will be forced to take the damage in its entirety. Bio: Kira is a young knight who has set out into the world to prove his strength to his kingdom. His lack of experience is balanced by his raw power and heart. The Young Paladin is a hybrid character. Dealing respectable amounts of damage and also healing off incoming damage is his forte. The two cards that set him apart from the other starting characters are Might and Heal. Might allows you to augment another attack with three hundred extra points of damage. This allows you to dish out quite the amount of pain, as early on three hundred points is a lot. Heal replenishes four hundred points of health, just your standard recovery card. Once he ranks to Veteran, he gains the powerful Holy Strike card, which allows him to deal seven hundred points of damage for five charges. This attack can also be mighted, allowing you to sometimes deal one thousand points of damage in one hit. Upon Master rank, the paladin gains Blessed Strike. It adds three hundred damage to a card, just like might, but in addition, makes it unblockable. Unblockable means it will bypass any shields, making it extremely effective against stall tankers, allowing you to slip past their defenses and strike directly against their HP. Use heal to out-sustain the opponent. Not many characters are equipped with healing cards, so with heal, you are at an advantage. Might is a cheap, cost-effective card, balanced out by the fact that it must piggyback on another attack. Use it whenever you can; a lone might is a useless card. You can enhance Holy Strike with Blessed Strike to create the Holy Blessed Strike, a mighty slice of one thousand unblockable damage. Bio: Blare is a mysterious young witch who's origins are from the Dark Forest. She is skilled with spells… fire being her most potent of spells. The Fire Witch is a complete, all out offensive character. She has minimal defenses, but wields powerful attacks and spell cards. She starts out with two extra spells: Inferno and Fireball. Inferno does three unblockable damage, good for piercing through shield defenses. Fireball, however, is what she is most famous for: one thousand damage in one fiery package of d00m. It is costly, but you can surprise the opponent by unloading a heap of meteoric pain on them. When she ranks to Veteran, she gains the burn card. It is a small, but cheap and cost-effective Damage over Time that slightly augments her damage. Upon master rank, she is presented with Incinerate. All you have to do is discard one extra card and pay 2 energy, and you can empower an attack with six hundred extra damage. This makes it one of the most potent attack modifiers in the game, for now. Do note you have very weak defenses; a common playstyle of Fire Witch is to quickly take down the opponent before they sustain serious damage. Against lower leveled opponents, Fire Witch can easily do a one-turn kill by charging to 19, then nailing the opponent with two fireballs. While burn may be weak by itself, it can help "burn" away shields, and if you can stack them up, they can be quite powerful. Bio: Once a servent of Nulgath, this Void Knight was banished from the legion for when he showed signs of free will. Now an outcast, this void seeks to create his own empire. The Blood Void is a high damage dealing character, similar to Fire Witch. His cards allow him to dish out high amounts of damage at a more consistent rate. His two cards are empower and Poison. Empower is identical to Might in every way, except it requires you to discard a card instead of using two charges. This makes it quite useful; if you have a card you don't need in your hand, you can discard it to raise the power of an attack by 300. Poison is a powerful DoT that deals twelve hundred damage over four turns: three hundred damage per turn. It's one of the most cost effective cards in the game, with its only weakness being it takes four turns to completely realize its potential. Veteran Rank grants it Life Drain, a combination of a 500 attack and a heal. In essence, you deal five hundred damage and heal four hundred, which is very handy in many situations. Master rank grants it Sacrifice, a 500 attack that doesn't require any charges; instead, you pay four hundred of your own health to attack. This makes the void very good at dishing out damage; both empower and sacrifice allow it to deal extra damage at the cost of resources other than charges. Empower requires three cards: Empower itself, a fodder, and an attack. The biggest possible hand is five, so you cannot use more than one per turn. Two poisons stacked on a target can inflicts six points of damage per turn, to a total of twenty four hundred, which is extremely potent. If you manage to stack three of them, your target is very likely to not be able to survive thirty six hundred points of damage. If you do not have enough health to use sacrifice but still use it, the fight will resolve with you losing. Bio: A protector of the forest, Ulric is an incredibly powerful alpha wolf of Marydia. His inherent power is lightning which he can spew from his mouth. The Lighting Wolf is an offensive character primarily focused on augmenting his attack cards. Both of his spells increase attack strength: Surge and Charged. Surge is basically a free Empower/Might. For no cost whatsoever, you can deal three hundred extra damage with an attack. Charged increases the power of all the attacks you use by two hundred for that turn. Ranking up nets him Storm, an extremely powerful DoT. It deals one thousand damage over two turns, five hundred damage per turn, allowing it to take out a typical shield card per turn. Master comes with Energize, a card that grants you ten charges in exchange for discarding an attack. This opens up new possibilities, allowing you to be more free with the spending of your charges or even gathering enough energy quickly enough to finish off the opponent. Charged, compared to might, is more cost effective if you have two or more other attacks affected by it. Storm is the only spell in the wolf's arsenal that does not affect attacks. While it is more cost effective, it still requires two turns to resolve. Time it to fire alongside a burst of attacks. Upon later ranks, the wolf loses several of his attack cards. This is problematic, as his deck is built around them. You will now have to use your attacks sparingly, and sometimes decide whether to energize or not. You will start out in Solace, the hub town of this game. Oversoul has several interfaces that can be used. They are described here. The Lobby is the main screen all players see when they log in. In this lobby, you can chat with friends and display whatever characters you may have possessed. Click on the floor to move around the lobby. The HuD along the bottom of the screen carries many helpful functions necessary to play this game. The large box with the text in it is the chat box. You can see the chat messages displayed here. If you want to send a message, click on the entry box below it, where it says, "Click to Send a Message", and type in what you want to say. Hit enter to send your message, and it will appear in the box. The "Battle" Column displays two options: Monster and Player Battle. Monster Battles immediately throw you into a battle against a computer-controlled opponent who uses a random opponent from a set pool of characters. Despite the name, you can encounter any sort of enemy, not just monsters. Player Battles play you against another real life player in combat with your characters. When you click on the button, it will queue you up until it finds another opponent ready to battle you. If you wish to leave the queue, click in the "Cancel" button on the box that appears. The next button is identified with a gear, the universal symbol for the Options menu. You can find several functions to adjust your gaming experience. Visual Quality: You can set the visual quality of the game to either low, medium, high, and best. Best will constantly adjust the quality to fit your computer's processing power to provide the best output. Lobby FPS: Adjust the amount of frames per second in the lobby. Sound/Music: Toggle the sound and music on or off. Sound consists of sound effects, such as charging effects or sword hit sounds. Music is the background music. If there is a check on it, it means it is turned on; if the circle is empty, the setting is turned off. Allow friend invites: Toggles whether or not you will automatically decline incoming friend requests. If a check is there, it will allow them to come through, and then you can decide whether you want to accept or not. If there isn't one, you will automatically decline all friend requests. Allow Duel Invites: Toggles whether or not you will automatically decline incoming duel requests. If a check is there, it will allow them to come through, and then you can decide whether you want to accept or not. If there isn't one, you will automatically decline all duel requests. The next array of six buttons, with the exception of Map and Elements, take you to the inventory screen. World will bring you into the overworld map. (Skip down to the Map section). Elements will show you a chart of elemental weaknesses and resistances. NOTE: ELEMENTAL DIFFERENCES HAVE NOT BEEN IMPLEMENTED INTO THE GAME YET. Above the seven primary buttons is a small interface box containing several indicators and buttons. Artifacts shows whatever artifacts you currently have in game. Clicking "Friends" brings up your friends list. The counter with the pale blue circle is your Soul Gems count. The green plus button brings up a window asking if you would like to purchase Soul Gems, Oversoul's secondary currency. The counter with a pile of gold is your gold count. There are four other buttons in the lobby, in the upper right hand corner of the screen. Get X-Boost: Brings up the X-boost Shop. You can purchase an X-boost here. Click on the link to find more about X-boosts. Characters Shop: Brings up the Characters Shop. You can purchase characters for gold and Soul Gems here. Purchased Characters will be obtained at level one. Click on the link for a current listing of the shop's contents. They are subject to change at any time. Camera: Takes a screenshot of your current Oversoul screen. You will have to right-click the image and click "Save As…" in order to download the image to your computer. Screenshots will not have your computer mouse cursor on it. To go back to the game, scroll down and click on "Close Screenshot." News: Brings up the news scroll. Any special events or offers will be written on it. Click on "Close" or anywhere off of the scroll to minimize it. It will appear by default every time you log in. You cannot toggle this function. If you click on another player while in the lobby, in the upper left hand corner of the screen, a menu with the portrait of their character, their name, their HP, and three options. Note: You currently cannot view the correct values of anyone's HP but your own. Duel: Sends the recipient a duel request. Should they accept, both of you would be thrust into a fight with your equipped characters. The person who sends the duel goes second, and the acceptor goes first. Add Friend: Sends a Friend Request. Should they accept, your names would be added to each others friends lists. Report: Brings out a window that allows you to report the player for violation of rules or offensive behavior. Select a reason for the report and click on the "Report Player" Button. Your complaint and a log of the chat will be sent to a moderator for investigation. There is easy navigation via the sidebar on the right. Characters: Brings up a list of characters you have possessed. Currently, there is no limit on how many you can possess. Scroll down the list using the sidebar or click on the elemental circles above to sort by element. Once you've highlighted a character, you can equip them by pressing the green "Equip" button on the bottom. Cards: Brings up a list of the character's deck and all its cards. More information about cards in the cards section. Char-Tree: Stands for Character Tree. It is the evolution tree upon which the equipped character can evolve. If your current character has an evolution and meets the requirements, you can click on its portrait in the tree to evolve it. Artifacts: Bring up a list of the artifacts you currently possess. Artifacts are items that can enhance your characters. Currently, only one artifact exists: X-boost. If you wish to exit the inventory screen, click on the X button on the bottom right hand corner. Portrait: A portrait of your equipped character. If you highlight another character on the list, this portrait will change to that character's mug. Life: The maximum health of your equipped character. If you highlight another character on the list, it will NOT change to that of the highlighted character; rather, it will stay that of the equipped. Alignment and Element: The element and alignment of your equipped character. If you highlight another character on the list, it will NOT change to that of the highlighted character; rather, it will stay that of the equipped. Element Dividers: Clicking on one of these will display only characters of the specified element in the character list. From left to right: Neutral, Fire, Ice, Energy, Earth, Water, Light, Shadow, Chaos. Character List: A list of all the characters you have possessed. Scroll down using the scroll bar. Equip button: When you click on this, you will equip the character you have highlighted in the character list. Will update the Life, Alignment and Element indicators. Portrait, Life, Alignment and Element: Same as before. Cards: A list of what cards your character may draw and utilize during battle. For more card information, skip to the cards tab in the Characters section. Portrait, Life, Alignment, and Element: Same as before. Level and Experience: Shows the level of the current character as well as the exp bar for it. Rank meter: Shows what rank the character is. Also serves as the apprentice option for Appearance Lock. Veteran Evolutions: The three nodes surrounding the Rank Meter are the windows for Veteran Evolutions. For more information, skip to the characters section. Master Evolutions: The three nodes below the Veteran Evolutions are the windows for Master Evolutions. For more information, skip to the characters section. Legendary Evolutions: The four nodes below the Master Evolutions are the windows for Legendary Evolutions. For more information, skip to the characters section. Lock Appearance: Once you click on one of the available pre-evolutions, you will designate the character as the target for Lock Appearance. Click on this button to lock that character's appearance onto your character. You will still have the same level and cards. You can only lock your appearance to available tiers of evolution; if you're a veteran, you cannot lock your appearance to master or legendary. Locked appearances are only visible to you. Note: Notice the green arrows around the veteran tier? Those green arrows indicate the fact that you can rank up your character to the next rank. In this case, it is a bug, since this Founder Champion is already legendary. For more information, skip to the characters section. Portrait: A portrait of the artifact. Artifact List: A list of the artifacts you possess. Note There is currently only one artifact, X-boost. You reach this interface by selecting World on the lobby interface. Click on the ground to move. Currency bar: Displays your current funds. Clicking on the green + button brings up the SG purchase window. Artifact: Displays your equipped Artifact. Any X-boosts you might have do not show up here. Options: Brings up the Options Menu. Friends: Brings up the Friends List (See Friends). Explore: Will explore the area. You will be thrust into battle against an enemy randomly chosen from a pool specific to that area. Go Back: Brings you back into the Lobby interface. Quicktab Bar: Buttons do exactly the same as the Lobby interface ones. See above for details. Camera: The camera function for taking screenshots. Oversoul: Your position on the overworld. Cloud: A random cloud that will float overhead from time to time. They do nothing but annoyingly obscure your vision of the ground. Note: This section only details what each item is. Head down to the Combat section to learn more about fighting in Oversoul. Player Overview: Shows your name, current HP, and character portrait. Will also indicate if you have an X-boost active. Player Shield Counter: Shows how many shield points you still have. Draw Cards: When you have an empty space in your hand, clicking on this will allow you to draw cards. Discard Toggle: Toggling this on allows you to discard cards. While on, it will glow red. Click again to toggle off. Unusable Card: A card that cannot be placed into playing queue due to lack of charges. Player Character: Your character is displayed here. Empty Space: The space that is left behind when a card is placed into queue. Usable Card: A card that can be placed onto the playing queue. Queued Card: A card that you have in queue, ready to be played. Empty Queue Space: Space awaiting a queued card. Play Cards/Charge Up: While no cards are in queue, this button will read Charge Up. Clicking on it causes you to charge in the element selected by the Charge Meter. When cards are in queue, this button will read Play Cards. Clicking on it ends your turn and plays the cards you have in queue. During your opponent's turn, this button will read "Opponent's turn" and be blacked out. Enemy Character: Your enemy's character is displayed here. Charge Meter: Lists how many charges you have of each element. Clicking on the gem will allow you to charge that specific element. Also sets the Charge Up button to that element. Options: Opens the options menu. See above for details. Screen Shot Tool: Takes a screenshot of the battle. Enemy Shield Counter: Shows how many shield points the enemy has. Enemy Overview: Shows the enemy's name, current HP, and character portrait. Timer: Shows how much time you have left in this turn. Characters are the main focus of Oversoul. The game revolves around finding and possessing them, then training them to be strong enough to fight other players. Every character is different, with different cards and styles of playing. They have their own appearances and some even have the capabilities to evolve into another, stronger form when you reach a certain level. Each character carries it's own level and cards. You, the player, do not have a level or attacks; the characters are what level up and wield certain moves, not the Oversoul. This section covers all the different parts of a Character. Each character has their own deck of cards. There are many different cards in this game, and a complete list of cards can be found here. Normal Attack : A basic attack card. It simply deals damage to the opponent. Unblockable Attack : An attack card, but with the unblockable effect. Cannot be blocked by shield cards, and will strike at HP directly. Shield Card : Will increase your shield counter. When you take damage, your shield will absorb the hit and be depleted by the numerical damage value. If your shield cannot take the hit, it will vanish and you will take any leftover overflow damage. Special Card : A special card, with unique effects. 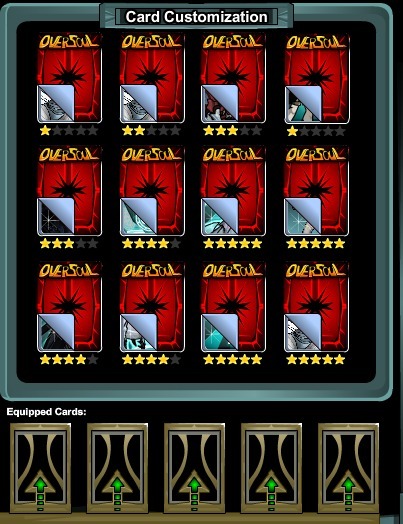 There are a variety of Special cards, and these are usually what makes a character unique. You could set up a reflection defense, stun an opponent, or poison them with a DoT. Almost anything. In battle, you might notice that a specific amount of cards played your attacks will be higher out with somethings stunning or giving the enemy a Damage over Time or a small 1 turn Stun. These are called Combo Bonuses. Combo bonuses work very simply. Playing 3-5 Attack Cards gives you a small buff (depending on the Card amount) and and other small effects that can help you greatly in battle. He'll go over quickly what works and what doesn't count. Each character has his, her, or its own unique appearance. Anything from a beetle, to a rat, to a knight, to a twisted fiend of darkness. Their powers are different, animations exclusive to that character. Each character starts off a battle with their own quote. Some, such as beasts, do not have a quote, but most do. For example, the Headless Horseman to the right sets the mood of the battle with a chilling laugh. A knight may proclaim his allegiance to his king. A wielder of darkness may state their love of death and destruction. An ambitious lad may issue a prideful challenge. During battle, each character also has their own attack animations. There are four types of attacks: 1-hit, 2-hit, 3-hit, and 5-hit. Each usually has its own animation, though some may be extra animations onto the previous movement. 4-hit attacks are animated as a 3-hit, followed by a 1-hit. 5-hit animations are usually the flashiest and the most unique; the character charges up their best move, their Coup de grâce, to unleash a cool attack to decimate the opponent. In the lobby, each character carries itself differently. A Founder Champion flies through the air on its wings. An Ice Beetle meekly crawls on the ground. Some simply run. Many characters in Oversoul have the ability to evolve into a stronger, higher ranked form. While some characters, such as Frogzard, Shadow Priest, and Light Fairy, do not have evolutions and stay the form they are, others such as all the starting characters, Earth Nomad, and Minotaur do have higher forms that can be achieved through leveling up. You can use the Character Tree to see the evolutions for the characters. Some characters, such as Ninja and Squire, have multiple options of evolution. See Character Tree in the Inventory tab of Interface for more information. There are four ranks of characters. Each is a reasonable estimate of the character's power. There are some exceptions, however. : Apprentice is the lowest rank. : Veteran is the next rank after apprentice. You must be a level 4 Apprentice to evolve into a Veteran. : Master is the next rank after Veteran. You must be a level 10 Veteran to evolve into a Master. : Legendary is the highest rank. You must be a level 20 Master to evolve into a Legendary. When the character is at a high enough level to be able to evolve into the next rank, you will see green arrows around any possible evolution nodes. Click on them to evolve the character into that node. Remember that this action is irreversible. The character will gain all cards and appearances of the new rank. If you wish to have the old look, you may use the appearance lock feature, but cards will stay that of the newer rank. Do note that appearance lock only works on your screen; other players will still see your newer rank's appearance. In addition, should the character have different evolution paths, such as Ninja, the other paths will be closed off from you once you have evolved into one of them. In order to possess the others, you will have to possess another lower rank and work your way up again. Choose wisely. Now when you're trying to possess a new creature or you're just not sure how to do it, everything shall be explained here for you.When possessing a new character for yourself it can be very rewarding, but also very tiring. You can find all sorts of characters to battle and possess on the World Map or if you would like to relax at times, the Characters Shop also will sell you a few Characters for Gold and Soul Gems. Not enough gold? Too little Soul Gems? There just has to be a much more easier solution! Thankfully for you, there is! Defeating a Character in Battle. When you finally defeat a character in battle, you will get a message like this at the end. Obviously, you're going to click "Accept" since it's a character you haven't gotten yet and you spent your time looking for him/her/it. "But I failed my possession!" If your possession chance has failed, don't fret! There's still more ways! We shall go over them now. As cheesy as this title is, it's a true common fact in the Overworld. You need to spend time searching for your characters. If you think that is useless, hey you're getting just more gold and exp for your troubles, making your own character much stronger. How is that a bad thing? Did your screen look something like this? This is the screen that if your regular chance at possessing a certain character failed, you are allowed to use One Soul Gem for a 100% capture rate! Not too shabby for a price of one, isn't it? "I Defeated a creature/Character, but I got its base form instead of the form it was at. Why?" "What if I try to possess a character I already have, will I get 2 of the same character?" No, you will a get a message like the one below telling you that you already Possessed the character. However, you can still possess a second one IF you do not have the base rank of your character in your inventory. Possession will grant you the base rank of a character, but if you already have a base-rank, you will be denied. for example you have Barbarian Veteran you can still possess the Barbarian, but if you currently have an apprentice-level Barbarian in your inventory, you will not be allowed to possess it. Some characters, such as Crypt Rogue and Poison Drake only have one form, so you can never possess a second one. Welcome to the Oversoul elements guide! In this guide, we will discuss how the elements work and how you can use them for yourself in battle! For more information on how to get started, please look at the Oversoul Beginner Guide! Neutral characters are very strong, but costly. When using a neutral character you will have access to both great offense and defense with cards like Counter Attack and Power Strike but it does cost a lot to keep these cards up in a battle. Examples of neutral characters are Sword Matron and Sword Warrior. Fire characters are the glass cannons of Oversoul. They're very strong when it comes to offensive attacks. In their decks, most fire characters have Fire Ball which can directly do 1,000 damage to an enemy and Incinerate which can add 600 Damage to a card at the cost of 2 Energy. But with that great offense, what a lot of fire characters lack is defense. They usually only have one shield card and they have no special cards that provide defense. Examples of fire type characters are Fire Witch and Headless Hollow. Ice characters are the tank characters. They have a great defense system, but lack a really good offense plan. They can easily stack up to max defense (2,000 Defense) and even use it as a large attack in the form of Ice Orb! Though it takes ice characters a very long time to do attacks. (One of their cards, Shatter, takes 4 turns to do 1,000 Damage). Also, Ice characters are able to cause you to lose your turns. (They can use their card Freeze to freeze/stun you for 2 turns!) Examples of ice characters are Barbarian and Frost Void. Energy characters are the really strong type characters. With an energy character you have access to cards such as Surge (which adds 300 damage to an attack card for no cost) and Storm which can help you a lot, but to keep Storm up, you need a very high amount of energy (Each Storm card takes 7 Energy!). You are also able to boost your attack cards with specials like Charged (which adds 200 damage to every attack) and Supercharged (which adds 500 damage to every attack). Even with a decent defense and a great offense you will sometimes have to sacrifice an attack card for more energy by using Energize. Examples of energy characters are Lighting Wolf and Storm Knight. Earth characters are the very tough characters of Oversoul. While they can have weaker normal attacks, their special cards can pack quite a punch. Earth characters are also able to stun you, but not as long as Ice characters can. (Petrify can only cause you to lose one turn) Some earth characters have access to a special card called Mountain Strike which can do 1,000 damage in only 2 turns! Earth characters are also able to use their defense as an attack free of charge unlike Ice characters but they're limited to 800 defense as an attack while Ice characters can turn 2,000 Defense into an attack at the cost of 10 Ice Energy. Examples of earth characters are Minotaur and Ogre. Water is the element of the patient. Water characters can heal and provide a decent amount of defense while having some constant attack cards that can hit. A few water characters have access to a card called Power Flow that can attack directly for 1,500 damage. A few examples of water characters are Katana Zon, Alpha Pirate, and Water Elemental. Light characters are the really well-rounded, prepared characters. They can have great offense as well as decent healing and shielding. Some light characters are able to reach legendary rank and get really good cards such as Greater Heal and Retribution; Greater Heal heals your character for 1,000 HP and Retribution can hit for +1,500 damage. Light characters can also access a card called Blessed Strike which can make any of their attack cards unblockable and add 300 damage to them, as well as Might which adds 300 damage to an attack card. Examples of light characters are Young Paladin and Father Time. Shadow characters are the sneaky characters of Oversoul. Shadow characters are able to use cards such as Poison and Mark of Death to cause damage over time. They can have a decent defense and offense while causing their damage over time. Shadow Characters are a force to be reckoned with most of the time. Examples of shadow characters are Vampire Lord, Ninja, and Darkon. Combat in Oversoul is relatively straightforward. Like all games, you will need to get your opponent's HP down to zero. Doing so will win you the match. Upon victory you will be shown a screen like the one on the right. You will gain Experience for your character and Gold for spending purposes. These rewards will scale off of your character's level. To learn the specifics, click here. After you click continue, if you are in a PvE battle, you will be offered the chance to possess the character and add them to your collection. See "Possessing a Character" in the Characters section for details. There are two forms of combat in Oversoul: PvP and PvE. PvP stands for Player versus Player, and PvE stands for Player versus Environment. PvE battles pit you against an opponent controlled by the AI, Artificial Intelligence. Differences from a real player include the fact that it takes no time to make their moves, as well as their characters being automatically scaled to match the level of your current character. Should your opponent leave in PvP, his control will be taken over by an AI in his stead. There are several ways to engage a PvE battle. PvE Battle: Located on the lobby Battle Bar (See Interface). Will immediately throw you into an AI battle. The enemy character will be randomly selected from a pool of characters. Explore: Located on the map Battle Bar (See Interface). Will immediately throw you into an AI battle. The enemy character will be a character randomly selected from the area. Different areas on the map contain different opponents. You may find the Fire Bat in the Fiery Cave, or perhaps a Barbarian in the Rocky Pass. Random Encounters: As you roam around the map, or any of the dungeons, you could be forced into a PvE battle. This is treated as a forced Explore. Player versus Player means what the name implies. You are pitted against another human being in combat. You will both use your own characters and fight until one of your HP bars reach zero, upon which the duel will end. PvP Random: Located on the lobby Battle Bar (See Interface). Will queue you into a PvP queue, and once another person also joins, you two will be forced into battle with your characters. The person who queued second gets the initiative, the first move. Dueling: The more ideal way for organized matches. On the Player Overview Interface, there is an option labeled Duel. Click on it to bring up a waiting tab like the one on the right. The challenged will receive a notification about the challenger with two options: Decline or Accept. Decline will close both player's notices and notify the challenger that the duel was declined. Accept will begin the duel. The challenger can cancel his or her challenge at any time before the challenged makes a decision by pressing "Cancel". Do note that unlike PvE, your levels will not scale to balance out. It is possible for a level 1 to be forced into combat with a level 20. Leaving the game will replace your character with an AI. Charges are integral to combat. In order to effectively battle in Oversoul, you must understand what the charges do. Notice that each card has a number in the top left corner. That number is the number of charges you must pay in order to be able to queue and then use the card. If you do not have enough charges to use the card, the card will remain blacked out and unable to be played. If you do have enough, they will light up and you will be able to click on the card, placing them in queue. In addition, your charges must be the element of the card you wish to play. For example, let us say you have Four Neutral Charges and Three Light charges. You wish to play the card to the right, a Light 500-Defend. Clicking on it will reduce your Light Charges to zero, but leave the Neutral Charges untouched. If you only had Two Light Charges, you cannot play the 500 Defend, even though you have Four Neutral Charges, because those are of a different element. Get the picture? This is the charge meter (See Battle Interface). It displays the amount of charges you have. You will start out with four neutral charges and five charges of whatever element your character is. If your character is neutral, they will only start out with five neutral charges. Here, my character is Light-type, so I start out with five Light charges as well as four neutrals. Now, how do you get more charges? There are two methods of gaining charges in this game: Charging and Regeneration. Charging: Clicking on the Charge Up button, which appears when you do not have any queued cards, will grant you charges. You can also click on the element you wish to charge on the Charge Meter. Regeneration: Every turn, if you play any amount of cards, you will regenerate some charges. The amount of charges you gain from Charging or Regeneration is called Charge Strength. Charge Strength increases as you continue charging of the same element. You will start out with a 2 charge, then as you continue charging, you will get 3 per charge, then 4, then 5. 5 is the maximum you can charge in a turn, the cap. Should you ever switch an element by using the charge meter, clicking on a different element than the one you were currently charging, your Charge Strength for that element will be reset to 1. The new element's charge strength also starts at 1. Charge Strength only increases if you use the Charge Up button or click on the charge meter. Drawing a new hand or playing cards does NOT increase charge strength. Several cards do not require charges, such as Empower and Sacrifice. These cards without a charge cost associated with it can be used by other elements without fear of having their Charge Strength reset. Oversoul hosts a turn-based combat system. Each player has 30 seconds per turn to make strategic decisions and to play their cards. This is the interface along the bottom of the combat screen. For more information, see the Combat Interface section above. We are going to be focusing an the cards. As you can see, your current hand is displayed on the Left Side. I currently have in my hand a special card called Retribution, two Holy Strikes, a Might, and a shield card. I currently have seven charges, as you can see on my charge meter. Therefore, I have enough to play any of the cards in my hand except Retribution, which requires 12 charges. You can see that it is different from the other cards because it is greyed out, therefore signifying the fact that I do not have enough charges to play it. Now, I can play the other cards. Take Holy strike for example; in order to place it into queue, I will click on it. It will disappear from my hand and appear into the queue on the right side of the screen. You will also notice charges being deducted from my charge meter. Now, I have a holy strike in queue and 5 less charges than before. Therefore, I can attack. Once I click Play Cards or wait for the timer to run out, my character will initiate the attack. If I want to remove Holy Strike from the queue, and not use it, I will click on the Holy Strike card in the queue. It will disappear and reappear in my hand. The charges will be refunded. Now notice the empty space left behind when the Holy Strike was removed from your hand and placed in the queue, like the one on the right. This "Empty Space" is also the button for drawing new cards. When you click on this empty space, it will end your turn and you will regenerate (see charges), but not gain any charge strength. All empty spaces in your hand will be filled up with new cards randomly chosen from your deck. If you still have cards in your hand when you draw, you will keep those cards. Only the empty spaces will gain new cards. For example, next turn, if I click on this empty space that used to hold the Holy Strike, I will gain one new random card from my deck. If I had two, I would gain two new cards. And so on an vice versa. Shields: Shields are always played first. Attacks: All normal attacks are then executed in the order you placed them in. Note that some spells, such as Holy Strike, Life Drain, and Sacrifice, are counted as normal attacks. They will be executed now as well. Spells: All spells except the ones counted as attacks will be played in the order you placed them in. So, take this queue for instance, in this order: Holy Strike, Heal, +5 attack, Shield, Greater Heal. Following the order, my character will shield first, then attack twice: The first hit will be the Holy Strike, the second the +5. Then, I will heal, then Greater Heal. Get the picture? After you play your cards, any special effects such as delayed attacks, Damage-over-Times, or Heal-over-Times, will affect your opponent. Then, your opponent will move. At the end of your opponent's turn, any of those effects affecting you will also be executed. The cycle repeats itself until there is a victor. Clicking "Friends" brings up the friends list. There will be a list of names of the people you have friended. All of them have an orb next to their names; if the orb is RED, they are offline. If GREEN, they are online. If you are in the lobby, the server will notify you if they log on. They still may be on a different server, however. You can hop to the lobby where your friend currently resides by clicking on their name, and then the "Goto Friend" button on the left side of the list. If you would like to delete a friend, click on the black circle inscribed with a cross underneath their name after you select them from the right list. This action is irreversible, but you can add them as your friend again should you two meet. If you cannot find each other again, simply use the "Add A Friend" feature at the top. Click on the button and type in their username. That will send a friend request to them. There are several types of players you may meet during the course of the game. Currently, there are five of them: Normal players, Founders, Testers, Moderators, and Developers. Each title, or lack thereof, has a different meaning. Normal Players: Normal, everyday players who play oversoul for fun. You make up the masses and are what keeps this game running and alive. Thank you for playing Oversoul! Normal players are identified by their white names and lack of title. Founders: Founders are players who purchased any Soul Gems package on or before January 13th, 2013. They supported the game since the beginning and are awarded with the Founder Adept character, which through arduous training, becomes the coveted Founder Champion. They are identified by the blue names and title, -Founder-. Testers: Testers are selected players who regularly test releases for bugs and report them directly to the developers. They are identified by the orange names and title, -Tester-. Moderators: Moderators are the people who take care of the game. They settle disputes and read any reports, keeping the community safe and productive. They are identified by the gold names and title, -Mod-. Developers: Developers are the creators of this game. They bring to you the new aspects and characters of Oversoul every release. If you ever see them, be sure to say hello! They are identified by the green name and title, -Dev-.